Theme: Adrienne Mayor, "The Mithridatic Wars - Historical introduction"
The Mithridatic Wars, pitting the Roman Republic against a defiant Graeco-Persian ruler of a small but wealthy kingdom on the Black Sea, involved some of the largest armies and bloodiest battles in Classical antiquity. A view of the remains of the city of Panticapaeum, the place where Mithridates would eventually take his own life. In the foreground are the ruins of the prytaneion. In the background, behind the hill, we see the modern Obelisk of Glory, erected in the modern Ukrainian city of Kerch.The source: Michael J. Taylor, "Imperial Greeks on the Mithridatic Wars - Ancient Voices"
In the town of Chaeronea, there stood a statue of the Roman general Lucius Licinius Lucullus. The reason that a Boeotian village should honor a Roman general was this: during the Mithridatic Wars, the Roman garrison commander occupying Chaeronea made sexual advances on a local youth, who in turn murdered the officer and fled to the hills. Theme: Cristian Violatti, "The Romans in Anatolia before the wars - Divide and rule"
In the early first century BC, Pontus grew stronger and more confident in the face of Roman interference in Anatolia. Tension escalated to the point where an open confrontation became inevitable. 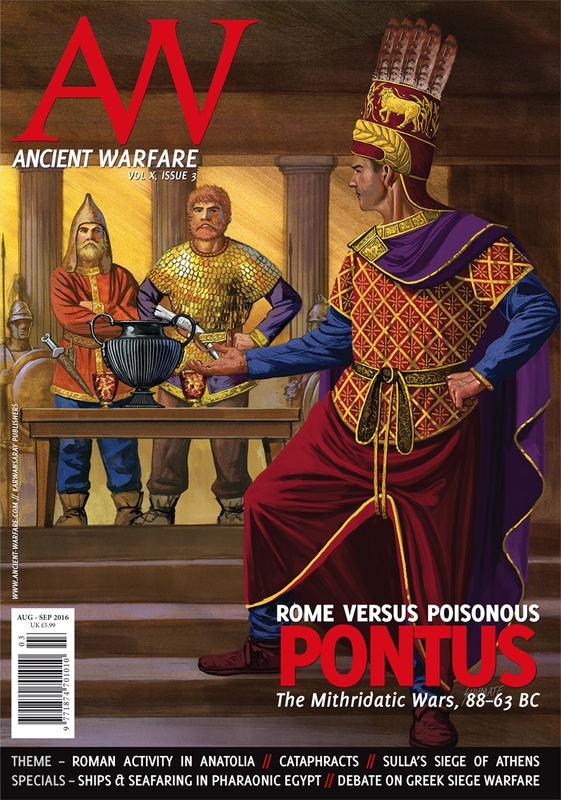 But what did the Romans do in Anatolia during the years leading up to the outbreak of the Mithridatic Wars? Theme: Nicolas Rostaing, "Pontic imitation legions used by Mithridates - Lost Pontic Legions"
Mithridates of Pontus made use of a variety of different troops in his armies, of which perhaps the most noteworthy were the so-called imitation legionaries, modelled after Roman infantry. These troops are mentioned by a small handful of ancient writers. A weary cataphract rests after battle. The iron plates of his scale armour are sewn onto a leather coat, providing double protection. An additional layer of larger iron plates covers the exposed shoulders, while overlapping iron rings (cheires) form sleeves. Reconstructions conducted by the Irani army in the late 1960s concluded that a typical set of cataphract armour weighed 57 kilo. On the march the rider would wear a surcoat to prevent the sun from overheating the armour. This cataphract’s horse is fully protected as well, the armour extending low enough to prevent enemies stabbing at the mount’s underbelly. Not all cataphract mounts wore such extensive armour.Theme: Sidney E. Dean, "Heavy cavalry of the Mithridatic Wars - Cataphracts"
Cavalry was a major part of the Pontic army, with cataphract heavy cavalry considered especially important. Pontic ruler Mithridates VI had so many cataphracts that he seems to have detached a sizable contingent to Athens as bodyguard and enforcers for his client, the tyrant Aristion. Cataphracts were also the linchpin of the armed forces of Armenia, which was allied with the Pontic kingdom. Theme: Alex Zakrzewski, "Armenia-s empire builder - Tigranes II"
In the midst of the Mithridatic Wars, King Tigranes II of Armenia (r. 95–65 BC), also known as Tigranes the Great, briefly built his country into the most powerful state east of R ome. Theme: Marc G. DeSantis, "Sulla and the Siege of Athens - Double siege"
The defensive walls of Athens and its port of Piraeus were some of the strongest of the ancient world. They stymied the mighty Spartans for many years in their attempts to make Athens submit in the Peloponnesian War of 431–404 BC. Centuries later, another army, this time from Rome, simultaneously laid siege to Athens and Piraeus in a protracted campaign that saw an enormous loss of life in both cities. 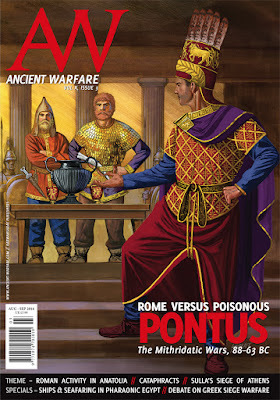 Theme: Aaron L. Beek, "The pirates of Mithridates - Pontic sea-dogs"
There is no doubt that Mithridates VI of Pontus posed a threat to Rome in the first century BC, probably the greatest foreign threat of that century. Key to his success was his ability to mobilize an army and fleet on short notice. How did Mithridates manage this mobilization? Through the large-scale employment of Mediterranean pirates. Theme: Adam Johnson, "A forgotten commander - Lucullus"
According to Cicero’s Academica, Mithridates himself described Lucius Licinius Lucullus (ca. 118–56 BC) as a greater general than any he had read about. Nevertheless, Lucullus arguably remains less well-known than other accomplished generals of the late Roman Republic, such as Marius, Sulla, Pompey, or Caesar. A model of an Egyptian sporting boat, dated to early in the reign of Amenemhat I (ca. 1981–1975 BC). From the tomb of Meketre, Thebes. Currently in the Metropolitan Museum of Art in New York.Special: Arnold Blumberg, "Sea-power and the Egyptian state"
The history of ancient Egypt is inextricably linked with the use of boats and ships, thanks to the importance of the River Nile. With their experience of navigating the great river, sail-powered vessels also ventured along the coasts of the Mediterranean and Red Seas, eventually extending the Pharaoh’s authority well beyond the borders of Egypt. The debate: Owen Rees, "The ineptitude of Greek siege warfare - Tear it down"
Students of Classical Greek warfare typically focus heavily on land battles, especially pitched engagements. Recently, there is also somewhat of a resurgence in interest in Greek battles fought at sea. However, interest in Greek siege warfare tends to be limited. Furthermore, in modern scholarship, the Greeks have an abysmal reputation when it comes to besieging cities. Do they deserve this bad reputation? Hollywood Romans: David L. Reinke, "Interpretations of Robert Graves's books - I, Claudius"
Robert Graves, one of the ‘war poets’ who emerged from the trenches of World War One, was a writer of prodigious talent. Today, Graves is best know for his works of historical fiction, especially I, Claudius (1934) and Claudius the God (1935). But it wasn’t until 1976, when the BBC undertook a television adaptation of the book that Claudius finally made his screen debut.